Endorsed by the PDC 180 machine Dave 'Chizzy' Chisnall, the new 80% Tungsten Chizzy darts feature a Micro Grooved, Radial Split grip area for a very intricate finish. 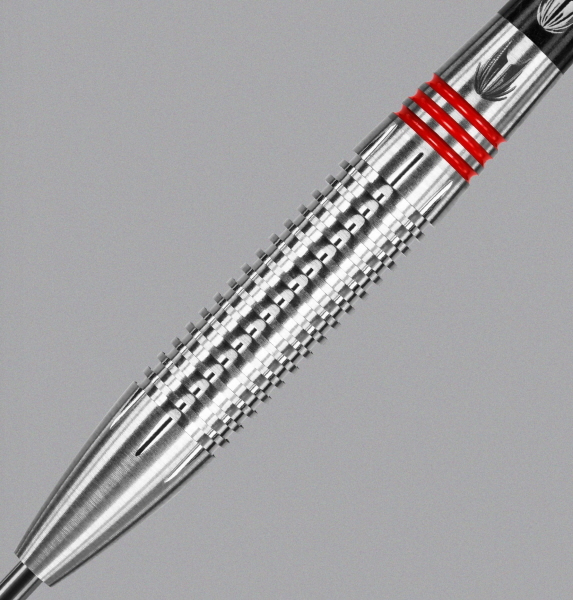 The dart features 3 Yellow rings to complement the Chizzy brand. Comes complete with Target Pro Grip Shafts and Vision Ultra Flights and Target leather darts wallet. With the likes of two-time World Champion Adrian Lewis and boxing icon Manny Pacquiao already part of Team Target Darts, it needed an exciting talent to stand up and make us take notice. So take a bow Dave ‘Chizzy’ Chisnall for making us do just that. Already a multiple BDO tour winner and a Lakeside World Finalist, Dave made the switch to the PDC in 2011 where he quickly established himself as a hugely dangerous force on the competitive Pro Tour circuit. A brilliant first campaign has seen him rocket up the PDC rankings, whilst an incredible 2012 World Championship win over Phil Taylor suggests that a major PDC title will be coming his way sooner rather than later. 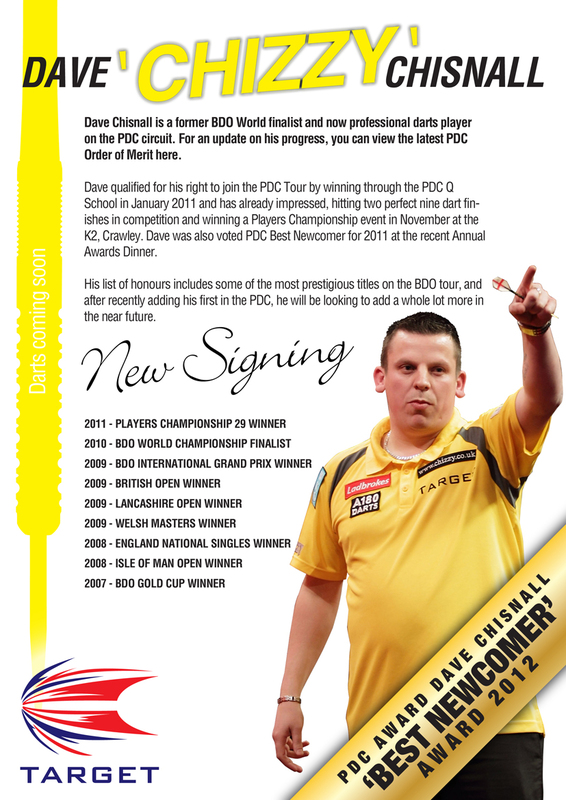 We are therefore delighted to welcome the power-scoring star to Team Target Darts on an exclusive three-year contract. With Dave’s natural darting ability and our expertise in creating the finest darts on the market we are positive that great things will happen. We are proud to welcome Dave to the Target Darts family and we look forward to what should be an exciting three-year darting journey. Stephen Bunting -- Stephen Bunting, winner of 2012 Winmau World Masters and many other titles, has joined Target's Stable. Target's new barrel design features 'Nano' grip technology -- a fine and effective champions grip. Target are proud to partner with BDO England Captain Tony 'The Silverback' O'Shea to produce a precision made dart that reflects his passion for the game. The 90% Tungsten dart is beautifully contoured and features a classic grip form to produce a dart with a superb grip and feel. This dart comes complete with Target Pro Grip Shafts, Target Vision Ultra Flights and bears Target's Lifetime Barrel Guarantee.